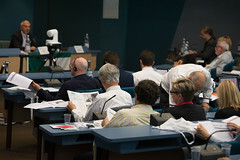 The Congress is the 'general assembly' of the UEF. It meets every two years; it consists of delegates of UEF constituent organisations. It determines the policy of the UEF, elects the UEF President, modifies provisions of the Statutes and elects half of the Federal Committee members. View more information related to the past Congresses. The UEF XXVI European Congress will be the occasion to discuss the European Federalists' strategy, campaign and policy proposals for the many challenges Europe is facing today: the completion of the Monetary Union, the development of the EU's social dimension, the reinforcement of the EU defense capabilities and, last but not least, the prospects for further political integration in view of the upcoming 2019 European elections. Most importantly, the Congress will be the occasion to review the shape and the way of working and financing of our organisation in a very difficult financial and organisation moment. Last but not least, the Congress is a expected to elect a new President of the organisation. The UEF XXVI European Congress will be hosted in the MuseumsQuartier and University of Vienna. Click here for the GoogleMap and Infokit. Participation to the UEF XXVI European Congress is open to delegates of UEF constituent organisations as well as to any observer that would like to attend the meeting. Registration is compulsory by 26th October 2018 by filling in the registration form. Communication: "Congress Vienna: *First Name* *Last Name*"
Amendments to the proposals for resolutions can be submitted by filling in an amendment form and sending it to resolutions@federalists.eu by 28th of October 2018.